Finally the local ski fields wont be complaining they have no snow but due to terrible conditions with fog and wind they don’t seem to be able to open. With school holidays happening or just around the corner things are becoming busier and I would imagine that ski fields are praying for some decent weather to open those slopes to the young ones. School holidays are a great time for parents to get away mid year with their children and take part in outdoor activities such as hiking, biking, skiing and of coarse fishing. 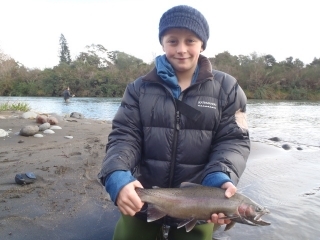 There are quite a few families which are wanting to combine fishing and skiing in the next few days which are all cuddled up in Turangi waiting for the weather or rivers to clear. I have been out on the river the last couple of days and have had a few fish from the braids and the Island pool but itÂ is hard to work out how many fish are in the river at the moment as it is highÂ and difficult for beginners to fish well. 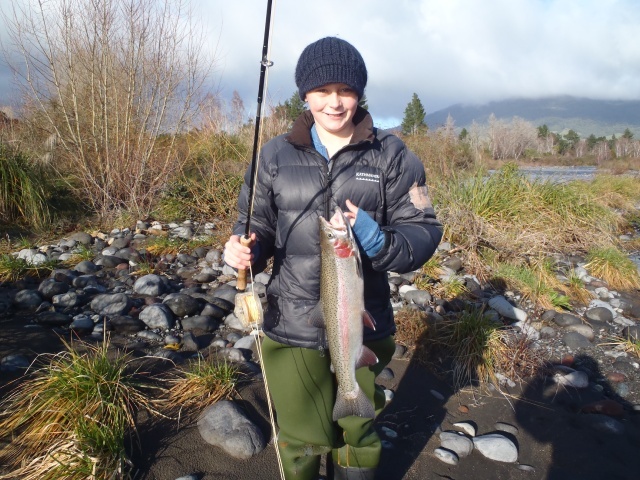 I have spent the last couple of days with Joe and son LeoÂ who are staying at Tongariro Lodge and are away for a few days with the family from Auckland. We have concentrated on fishing the edges of the dirty water or in places which fish may rest in due to high water as it is very hard to fish the main flow in such conditions. 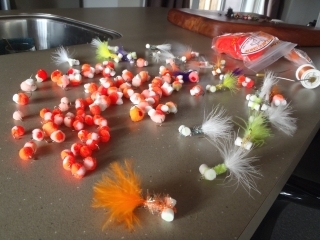 This morning the river was running at 78 cumecs which in my book is the perfect time to be on the river fishing certain by-passes with brightly coloured glo bugs and it was not a surprise to see young Leo’s rod buckled over with a fresh jack after about 10 casts. Having never fly fished before I was amazed to see the trout still attached after Leo had managed to pull the indicator 3 eyes deep into his rod and was hanging on for all life but somehow the hook stuck long enough for me to sort things out. After a quick bit of instruction on letting the fish take line Leo was playing the fish well and it was not long before we had it in the net. Naturally Leo was pretty excited at catching his first trout and after a quick knock on the head he was straight back into it and hunting the next one. I remember my first trout like it was yesterday and the feeling that I used to experience while fishing with Dad so it was nice to be apart of this father son outing. All the trout we have caught in the last couple of days have been males so if what I believe in is right the females should be on their way up and will be in the town pools in the next day or so. In my experience males move into the river first, followed by the usually bigger groups of females so lets hope this happens in the next few days. The conditions are quite good for it as long as we don’t get anymore long periods of rain as this may cause a flood and push everything back.Â Â The cold winds are blowing in on most river mouths which are perfect for sending fish into the lower reaches so from there it really is a matter of being in the right place at the right time. 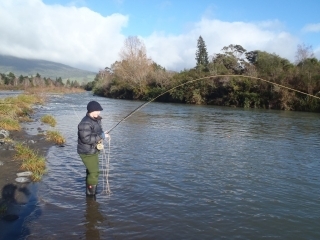 Being in the right place at the right time means sometimes fishing in the wind, rain and even swollen rivers. Many fish go undetected due to no fisherman on the rivers and can have run through to the upper limit before you decide the conditions are good for you!!! With rivers high an slightly dirty the wetline should always be carried and be a go to method for many anglers. Swinging a large black or green fur fly in the edges of any pool will produce fish when conditions are different or not quite suit your prefferedÂ method “nymphing”. Pools such as Major Jones, Hydro and Admirals are always my favourites as the always hold fish and are quite safe to be wading deep in. I’m picking that a few more big browns will fall victims to wetlines and dirty water in the next few days, especially from the Hydro. 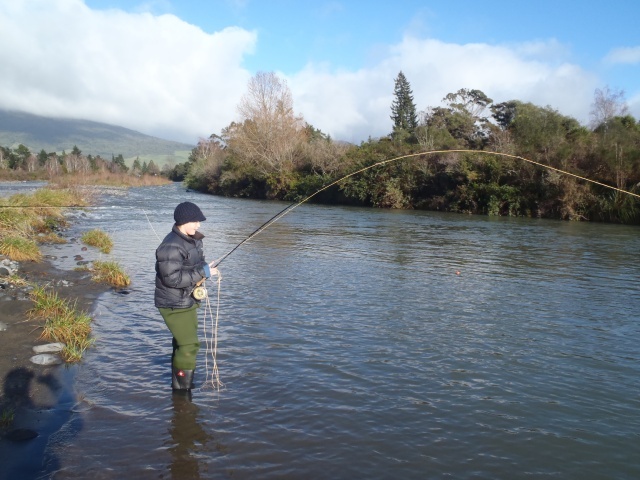 A quick round up on the rivers this afternoon resulted in only the Waytoohardanui and the Tongariro really being fishable. The Tauranga Taupo was very high and quite dirty and should be a very good place to pick of fresh fish in the next couple of days, concentrate on the staight below the main road when this riverÂ is high and grubby. The Hine was much the same but maybe slightly clearer which should be fishable on Wednesday or Thursday with no more rain. The Waiotaka and Waimarino were both no good and will be out for a few days until levels settle down. The Waiotaka was just coming over the road when I was on my way home so these smaller rivers may be out till the weekend or more. I have not spent alot of time on these rivers in the last year and would hate to think how many times things have changed in them in the last few floods, might be worth exploring? Prior to the last few days I was stuck at home with a bad case of man flu which as most males would appreciate could be fatal to most females. Being stuck inside is just not my thing but I did spend the time wisely getting ready for the next few weeks fishing with some new styles of glo bugs and heave and leaves-shame to use them really!